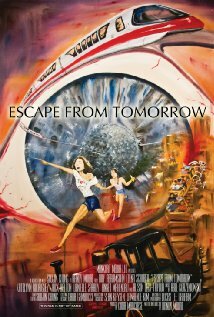 Randy Moore’s provocative, much buzzed-about film Escape From Tomorrow, which was secretly shot at Disneyland and Walt Disney World, will get a theatrical release this fall, on Oct. 11, in theaters and on VOD, by Producers Distribution Agency (PDA), according to IGN. This film will be distributed in partnership with Abramorama and FilmBuff, Deadline reports. IMDB describes this movie thusly: In a world of fake castles and anthropomorphic rodents, an epic battle begins when an unemployed father’s sanity is challenged by a chance encounter with two underage girls on holiday. This entry was posted in Disneyland, Disneyworld, Movies, News and tagged Disney World, Disneyland, Escape from Tomorrow, movies, Randy Moore. Bookmark the permalink.